Difference between revisions of "WTP 30 Facets Usability"
:: This is an important usecase, but there are a lot of technical details to work out. I'd change the order and present the target runtime first and let that influence the supported spec version. Users are typically constrained by a particular runtime. Currently the defaultFacets extension point lets runtime author specify the versions of facets that are selected by default. If we add spec version as an extra bit in the equation, the extension point would need to be revised to be able to handle this case. There is not enough information currently in the model to implement this UI. Need to think more about this. :: I think it would be better this drop down box to contain the available Java EE spec versions supported by the selected runtime. It would be easier for the novice user to select the desired Java EE spec version (J2EE 1.4, Java EE 5, ...) rather to decide which project version matches which Java EE spec version. There should be no technical issue for this, because Java EE spec versions and primary facet versions match one to one. :*The user would then select a target runtime, with option to create a new one. :*The user would then select a pre-canned product configuration or a configuration given to them by their organization. If an advanced user wanted to modify the facets for _this project_, they would select "Add/Modify Facets". This would take them to the facet selection page in a dialog. This facets page would no longer be the second page in the wizard flow. Once a user changes the facets, we would switch the configuration to "Custom". If the user were to then switch to a different configuration, they would lose the previous changes and get the default for that newly selected configuration. The user would have an option in the advanced dialog to open a link to the configuration editor, where the current selections would be defaulted in, and they could give the new configuration a name and save it from there. :: I am not sure i understand this suggestion. Is the idea that we would replace the paragraph beneath the drop down with a fancier UI? I heard a comment at the meeting that we would make the allocated space larger for longer descriptions. The existing UI will already resize the space if more than two lines are necessary. :*The user could then select to add to an EAR. :: The "EAR project name" should contain only EAR projects that can include the selected version of the project under creation. 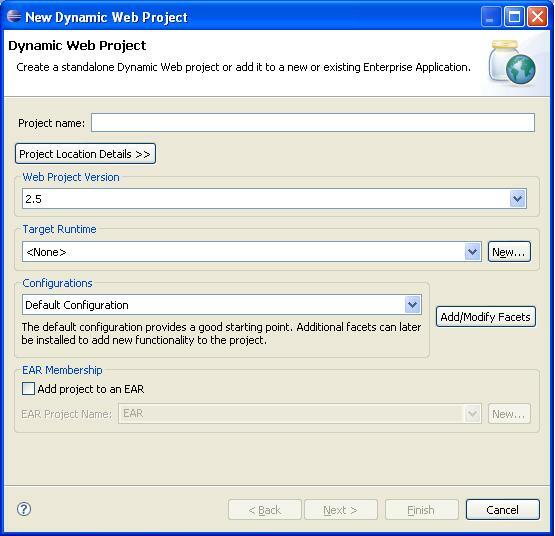 For example an EAR 1.4 project cannot include Web 2.5 project. :*The next pages in the wizard would be the facet install pages for the selected facets in the new project. The complex facet selection page will not be in this page flow. Optionally, a novice user could just hit finish from the first page. ::*[https://bugs.eclipse.org/bugs/show_bug.cgi?id=135950 135950] - Support dynamic help for individual facets. :* [P2] Improve the behavior of the facets selection panel. ::*[https://bugs.eclipse.org/bugs/show_bug.cgi?id=136008 136008] - Facets selection panel should filter out unselectable facet versions. ::: Right now this one is a problem statement without a solution. Perhaps a short explanation label coupled with context help can address this. Other ideas? ::: Perhaps rather than trying to solve the general problem, we can solve some of the common use cases. For instance Java -> Utility right now is possible but is rather obscure. Java -> Web is often requested on news groups (migration path for people adopting WTP for the first time).